Update: The second volume of S U R V I V E’s Stranger Things soundtrack is officially available for your flashlight-lit investigations of creepy government experiments. The release, exclusive to iTunes, offers 39 additional tracks, including a five-minute extended version of the title theme. Earlier this week, Lakeshore Records also announced a vinyl release for the soundtrack, as well as a live Stranger Things concert performance at Kraków's Unsound Festival in October. How's that sound? Drake? Justin Timberlake? Calvin Harris and Rihanna? 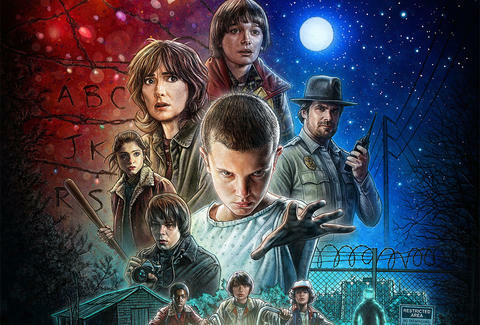 As 2016's "song of the summer" debate rages on, pop enthusiasts overlook the season's one true sensation: the ethereal '80s electronica tracks beaming out of Netflix's Stranger Things. Really, any one of them could earn the title. The nostalgic adventure series sent our eyeballs back through 30 years of Spielberg-esque movies and TV, but also filled a void vacated by acts like Tangerine Dream and Vangelis. The only issue: the soundtrack wasn't independently available. Those spending the final days of summer conjuring Stranger Things Season 2 questions didn't have the appropriate music with which to flood their imaginations. Until now. On Friday, Netflix unveiled the official Stranger Things soundtrack album. Appropriate to the show, there's a twist: the 36-track album is only Volume 1. A second volume arrives digitally August 19th. Both volumes feature bits of the original score by Kyle Dixon and Michael Stein, members of the popular Austin experimental synth band S U R V I V E, best known for playing alongside Goblin, Tame Impala, and This Will Destroy You (among others), and for their work on 2014's underrated action movie The Guest. “We discussed having a classic tone and feel to the music for the show but being reserved enough that it wasn't ’80s cheese, while offering a refreshing quality so that felt modern," Dixon said in a press release. "This was one of the qualities that drew them to our music in the first place. Having a familiarity with classic synths worked, but with an overall forward thinking approach." Currently, Stranger Things, Vol. 1 is only available on iTunes. You can preview the tracks below. And if you're in the market for even more '80s synth gold, we'll recommend John Carpenter's Lost Themes I & II, Jeff Grace's Cold in July soundtrack, and Jaga Jazzist's Starfire. There have never been more options for soundtracking your terrifying walks home alone at night than right now. Stranger Things isn't the only Netflix album dropping this week. The Get Down original soundtrack bows in conjunction with the six-episode half-season debut, and includes new tracks from Miguel, Zayn, Christina Aguilera, Leon Bridges, and many of the young cast members, including Jaden Smith. You can hear Miguel's contribution, "Cadillac," below.